Under the patronage of His Highness Sheikh Mansour Bin Zayed Al Nahyan, Deputy Prime Minister and Minister of Presidential Affairs, Chairman of the Abu Dhabi Agriculture and Food Safety Authority, the Global Forum for Innovations in Agriculture (GFIA), the leading exhibition and conference on sustainable agricultural solutions opens on Monday from 1st to 2nd April 2019 at Abu Dhabi National Exhibition Centre (ADNEC). The sixth edition of GFIA, will focus on how Artificial Intelligence (AI) can drive progress in agriculture towards increasing food production and ensuring food security in the Middle East and North Africa. Held at Abu Dhabi National Exhibition Centre (ADNEC), GFIA is co-located with the 2nd ApiArab Expo, 2nd Arab Beekeeping International Conference and for the first time in the Middle East, the 15th Annual Asian Apicultural Association (AAA) Conference. Announcing the event at a press conference at the Abu Dhabi Chamber of Commerce were His Excellency Eng Saif Mohamed Al Shara, Assistant Undersecretary for the Food Diversity Sector at the Ministry of Climate Change and Environment; His Excellency Mohamed Hilal Al Muhairi Director General of Abu Dhabi Chamber of Commerce and Industry (ADCCI); His Highness Sheikh Salem bin Sultan Al Qasimi ANHB Chairman; Professor Ahmad Al Shazam Al Ghamdi Chairman of Arab Beekeeping Organization; and Thamer Rashed Al Qasemi, Chairman of GFIA Organising Committee. 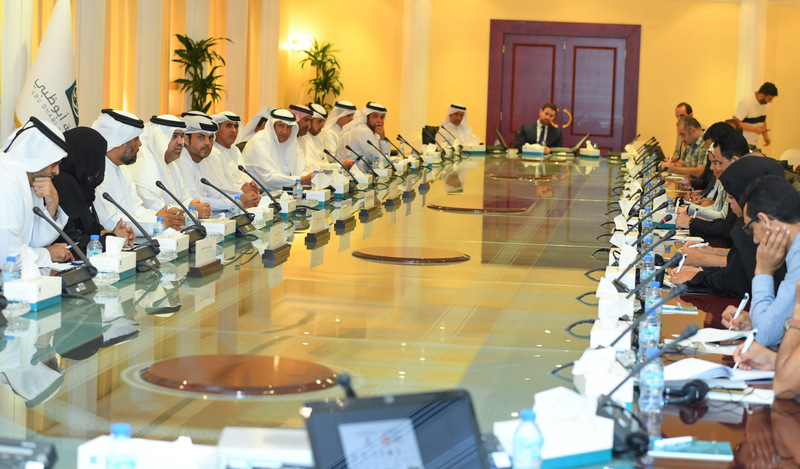 HE Saif Mohammed Al Shara, Undersecretary of the Ministry of Climate Change and Environment in the Sustainable Communities Sector, praised the establishment of the Abu Dhabi Agriculture and Food Safety Authority, stressing the Ministry’s interest in strengthening the partnership with the new body to achieve the vision of our wise leadership and the common objectives of both sides. He pointed to the special attention given by the founding father, Sheikh Zayed bin Sultan Al Nahyan, to the development of the agricultural sector in the country and the continued support of our leadership in the food production sector. Al-Shara affirmed the Ministry’s unlimited support for the Forum’s objectives related to innovation, partnership or investment. He pointed out that innovative solutions alone are capable of facing the pressures and challenges facing the food production sectors and meeting the growing demand for food as a result of future population growth. He said: “The Ministry of Climate Change and the Environment is currently working with its partners in the public and private sectors to find innovative solutions to develop food production sectors and enhance their ability to contribute better to food security and the national economy by focusing on increasing productivity and ensuring quality. He pointed out that the development of this sector on commercial bases is one of the most important issues in the policy of food diversification, which the Ministry seeks to achieve its objectives, in cooperation with its partners in the governmental, private and multi-stakeholder sectors through the dissemination of agricultural innovation. The transfer of modern and sustainable technologies and practices to those working in this field, attracting more private investments, reducing waste of food, and enhancing the capacity of the country’s agricultural systems to adapt to climate change is also of significant importance. HE Mohammed Hilal Al Muhairi, Director General of the Abu Dhabi Chamber of Commerce and Industry (ADCCI), affirmed the role of the Chamber as a supporting sponsor of GFIA as one of the world’s leading events in the field of investment in agriculture, livestock and fisheries and its innovation technologies said: “Abu Dhabi Chamber of Commerce and Industry is looking to the Global Forum for Innovations in Agriculture 2019 in Abu Dhabi, to create areas of cooperation with international companies to explore opportunities to operate in the country, in order to ensure the provision of the needs and requirements of the local market, as well as opportunities for investment in the food and agricultural industries. This will support the agenda of achieving food security of the UAE and increase the economic growth of Abu Dhabi.” The Director General of Abu Dhabi Chamber of Commerce concluded by expressing his confidence in the success of the Forum and paving the road to providing opportunities for building strong projects between the public and private sectors that contribute to the sustainable development of the food sector in the UAE. Over 100 countries will exhibit their products and projects promoting sustainable food production to more than 8,000 visitors expected to attend the free to attend two-day conference and exhibition. GFIA will include over 50 ag-tech innovations from across the world being showcased for the first time in Abu Dhabi and the GFIA Innovation Awards will recognize innovations which will improve global security. GFIA is dedicated to sustainable agriculture across all types of food production and this year’s event will incorporate five clearly defined exhibition zones: Indoor Farming and Hydroponics, Livestock and Animal Production, Date Palm Production, Aqua Tech, and Sustainable Crops.